Skincare out of the way I then move onto Primers. I've been loving the new Smashbox Photo Finish Radiance Primer (€38.00). It has quickly become one of my favourites for sure. It gives the skin radiance while also leaving the skin feeling moisturised due to it containing hyaluronic acid. After that I go in with my Smashbox Primer Water (€25.00), this in my opinion is one of the best inventions ever. I absolutely love it and cannot be without it. I always have a spare bottle so that I never run out. Smashbox is my go to brand for Primers and I definitely think they sell the best ones! For foundation I have been using the No7 Beautifully Matte Foundation (€20.00). Although I don't suffer with oily skin I love a matte finish and I've been really enjoying this foundation lately. I usually use their Stay Perfect formula but I find this also doesn't stick to any dry patches etc which I love about the formulas! To conceal spots I've been using my trusty NYX HD Concealer (€7.75) and for my under eyes I've been really enjoying the Bourjois Radiance Reveal Concealer (€10.23). I find both these concealers don't crease and last hours before having to touch them up. For powder I've been using the trusty Rimmel Stay Matte Powder (€5.99). For the price it's great and it does what it's supposed to do. For my brows I have been obsessed with the Freedom Brow Pomade (€7.01), this stuff is insane and I find it so easy to achieve the brows I want when I use this. To set everything in place I've been using the Benefit Gimme Brow (€26.00). I honestly don't know how I lived without this, the hype around it just never made me want to buy it and now that I have it I now understand the hype about it. Onto my favourite part, the eyes! My current go to eyeshadow palette has been the Smashbox Cover Shot Ablaze palette (€31.00). This palette consists of the most gorgeous burgundy and burnt orange shades I cannot get enough of it. I've been using gel liner for years now and the current one in my makeup bag is the Rimmel Scandaleyes Gel Liner (€8.49). This stays on great and does not budge until I apply makeup remover. Finally for mascara I've been slightly obsessed with the Smashbox Full Exposure Mascara (€23.00), I just find that this adds volume and length but without clumping which I really like. Finally for bronzer I've been using my Nars Laguna Bronzer (€38.00). When I first got this I really did not like it but I've finally given it another chance and I absolutely love the colour on my skin. My trusty Sleek Solstice Highlighting Palette (€14.49) has not left my side since I bought it back in Summer. I honestly don't think I will ever find a nicer highlighter than the peach shade in this palette. Lastly for lips I've been loving Kylie Cosmetics Lipkit (€27.20) in the shade Dolce K. This is the only thing that changes everyday but I could only chose one and this is in my top 3 go to shades. 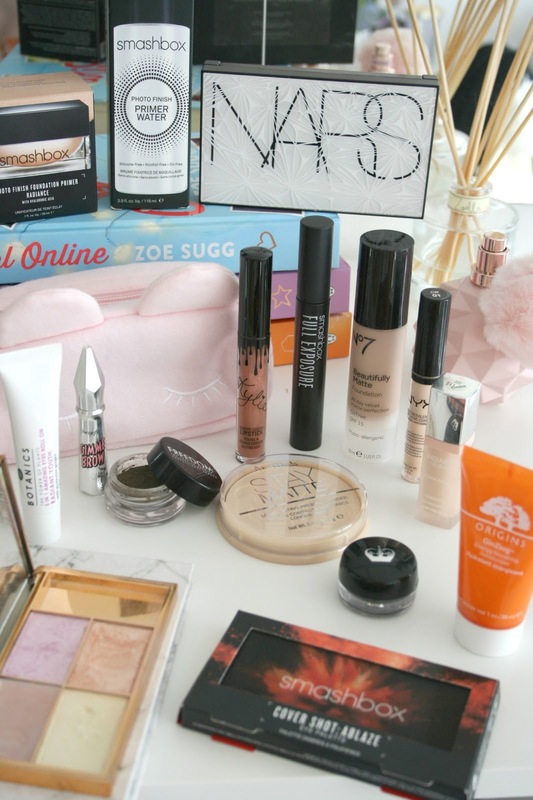 That's everything in my makeup bag right now! Love your picks here, so many things that are on my wish list! I still need to get my hands on that Sleek highlighting palette! I spy some of my favourites here, the Origins moisturiser sounds amazing!